Revlon has a fairly new display out that features a collection called Masquerade. These are Limited Edition shades, and there are a total of eight different polishes. I picked mine up at Walgreen's a couple of weeks ago and you can view the display here. These are the three shades that came home with me. 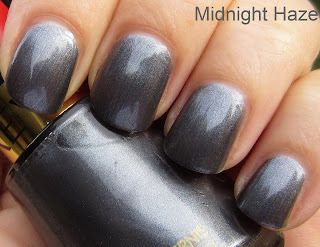 Midnight Haze is a medium charcoal grey shimmer. The formula was very nice, and I used two coats. 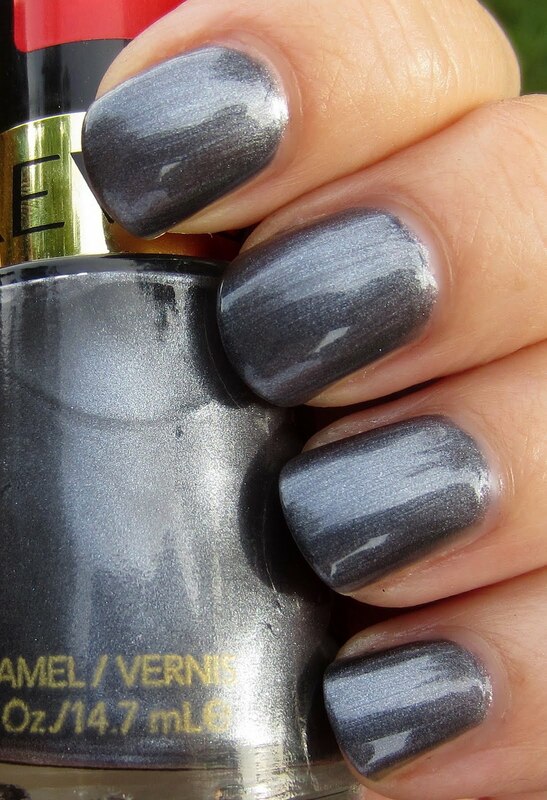 I guess it's nothing out of the ordinary, but I love a nice basic charcoal shimmer, so it's all good! 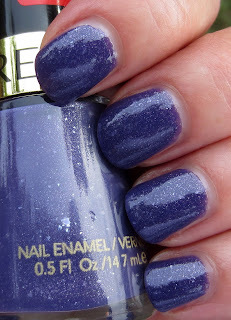 Royal Cloak is a must-have if you like purples and flakies. The glitter isn't overpowering at all, but it does add that special something, don't you think? I like this shade of purple, and you could call it a medium purple or a deep lavender. It's actually a bit of a muted shade in reality. 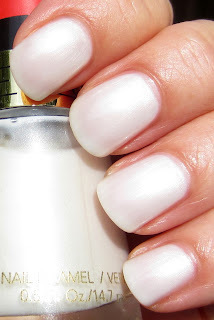 Again, a great formula that took two coats for this look. 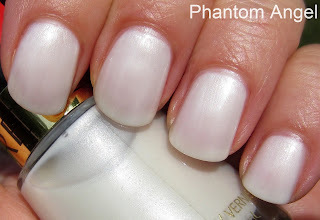 Phantom Angel is a soft white shimmer with a pearl finish. This one took three coats, and I'm not entirely satisfied with the coverage. Every now and again I come across a white that I love, and while I like this one, it's not love. I thought this might be something like Revlon Powder Puff from the Matte Suede line only with a glossy finish, and it is to some degree. It just didn't cover as nice as Powder Puff did after only two coats. I'm loving the names of these polishes, and I'm very happy with the look of Midnight Haze and Royal Cloak. I can still see some streaking on Phantom Angel after three coats however, so that makes me like the name better than the polish! Have you seen this collection yet? I haven't found this display yet. Royal Cloak is beautiful! Revlon really stepped up their game this year. 3 awesome polishes! Thanks for sharing! Royal Cloak is really pretty. I have to buy this. wow, i have to go buy Royal Cloak this instant. thanks for the photos! Royal Cloak is really pretty! My eye goes right to that one and I am not among those of you who are HUGE purple fans. Like it but don't need every purple that comes out.